Samsung ER-655 Electronic Cash Registers at Cash Register Store. 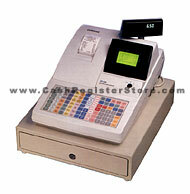 The Samsung ER-655's are fully equiped electronic cash registers. Higher end, more expensive Samsung cash registers have VERY LITTLE over these cash registers. The Samsung ER-655 cash register comes standard with a full size cash drawer, flat spill-resistant keyboard, multi-line LCD operator display for easy training, programming and general use, and 2 RS232 ports. The only difference between the Samsung ER-650 and the ER-655 is the printer. The Samsung ER-655 features a dot-matrix alphanumeric printer utilizing standard calculator paper. Optional communications software can be used to upload or download your cash registers data directly from a PC, or via a phone modem. Daily transaction details, as well as sales and financial reports can be uploaded to your PC for storage and/or further review.